In October 2011, the U.S. Department of Justice filed a motion to seize a palatial cliff-top home in Malibu, California. The 16-acre property towers over its neighbors, with a palm-lined driveway leading to a plaster-and-tile mansion. Situated in the heart of one of the United States’ most expensive neighborhoods, the $30 million estate includes a swimming pool, a tennis court, and a four-hole golf course. In its complaint, the Justice Department also set its sights on high-performance speedboats worth $2 million, over two dozen cars (including a $2 million Maserati and eight Ferraris), and $3.2 million in Michael Jackson memorabilia — in total, assets equaling approximately $71 million. What made these extravagant possessions all the more remarkable was that they belonged to a government worker from a small African country who was making an official salary of about $80,000 a year: Teodoro Nguema Obiang Mangue, the oldest son of and heir apparent to Teodoro Obiang Nguema Mbasogo, the longtime president of Equatorial Guinea. Home to over one billion barrels of oil reserves, Equatorial Guinea has exported as many as 400,000 barrels of oil a day since 1995, a bonanza that has made the country wealthier, in terms of GDP per capita, than France, Japan, and the United Kingdom. Little of this wealth, however, has helped the vast majority of Equatorial Guinea’s 700,000 people: today, three out of every four Equatorial Guineans live on less than $2 a day, and infant mortality rates in the country have barely budged since oil was first discovered there. The president’s family members and other elites connected to the Obiang regime, meanwhile, have prospered. As a result, Equatorial Guinea has become a textbook example of the so-called resource curse, a global phenomenon in which vast natural resource wealth leads to rapacious corruption, decimated governance, and chronic underdevelopment. Worse still, for the last three decades, the Obiang family was able to trade and travel freely around the world, until the Justice Department finally moved to seize the younger Obiang’s home and possessions on the charge that he had used his position and influence to acquire illicit wealth. The United States’ recent crackdown is laudable, but the family’s ability to travel and conduct business in the United States and around the world for so long highlights the gaps in the architecture of international accountability and justice. Equatorial Guinea’s story yields many foreboding lessons, but none more obvious than this: oil-rich developing countries that want to avoid the resource curse cannot wait for the international system to fight corruption for them. Equatorial Guinea’s example will become increasingly relevant over the next decade as a massive wave of new oil and gas discoveries transforms Africa’s economic and political landscape. Over the next ten years, new technologies will allow oil producers to extract billions of barrels of exportable oil from the East African Rift Valley and West Africa’s Gulf of Guinea. If current estimates are even close to accurate, trillions of dollars in oil revenue will ultimately descend on a dozen African countries that have never before experienced such influxes. In East Africa, that list will likely include Ethiopia, Kenya, Malawi, Mauritius, Tanzania, and Uganda; in West Africa, it will probably include Gambia, Ghana, Liberia, São Tomé and Príncipe, Senegal, and Sierra Leone. (Niger is another possibility, but given the lack of firm estimates of its oil reserves, it is not included in the calculations here.) And this windfall would come on top of the enormous oil revenues that some still-poor sub-Saharan African countries, such as Angola, Chad, Gabon, Nigeria, and Sudan (and South Sudan), have been earning for decades, as well as the new oil revenues that Ghana is beginning to accrue. All told, within a decade, a third or more of African countries may derive the majority of their export earnings from oil and gas. Oil booms poison the prospects for development in poor countries. The surge of easy money fuels inflation, fans waste and massive corruption, distorts exchange rates, undermines the competitiveness of traditional export sectors such as agriculture, and preempts the growth of manufacturing. Moreover, as oil prices fluctuate on world markets, oil-rich countries can suddenly become cash poor when booms go bust (since poor countries rarely save any of these revenue windfalls). Oil booms are also bad news for democracy and the rule of law. In fact, not a single developing country that derives the bulk of its export earnings from oil and gas is a democracy. Rather than fostering an entrepreneurial middle class, oil wealth, when controlled by the government, stifles the emergence of an independent business class and swells the power of the state vis-à-vis civil society. In Africa, then, where one-party dominance or outright authoritarian rule prevails, as in Ethiopia, Gambia, Tanzania, and Uganda, oil wealth will further entrench it. And where democracy is struggling to sink roots — as in Kenya, Liberia, Malawi, Senegal, and Sierra Leone — it could easily overwhelm weak state institutions. 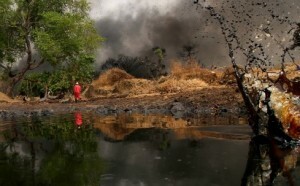 Even Ghana, the most liberal and stable democracy in West Africa, could fall victim to the problem of oil revenues. The country now exports fewer than 100,000 barrels a day, but that figure is estimated to soar to as much as half a million barrels by 2015. If used wisely, this influx of capital has the potential to fund pathbreaking improvements in physical infrastructure and human well-being. But if state officials, enabled by the absence of meaningful institutions of transparency and accountability, manage to divert the oil revenues to themselves, then the new wealth will serve only to further consolidate the power and inflate the personal fortunes of the ruling elites. There is no reason to expect that newly rich oil producers in Africa will meet a fate much different from that of Angola, Equatorial Guinea, Nigeria, and Sudan, all of which rank in the worst fifth of all countries in terms of bribery and corruption. Unless, that is, African governments embrace a radical policy approach: handing a large share of the new revenues directly to the people as taxable income. The influx of funds from new oil discoveries will be so large that if properly managed, it could catapult developing countries into genuine economic and social development. By taking control of these revenues out of the hands of the political elite and restoring the link between citizens and their public officials, this “oil to cash” strategy offers the best hope for tomorrow’s oil-rich African nations to avoid the fate that has befallen so many of yesterday’s. For a long time, those who studied economic development assumed that valuable natural resources were a blessing — that, as the scholar Norton Ginsburg wrote in 1957, “the possession of a sizable and diversified natural resource endowment is a major advantage to any country embarking upon a period of rapid economic growth.” Since the 1980s, however, experts have come to the consensus that the opposite is true. In fact, the economies of resource-rich countries have performed far worse than those of their resource-poor neighbors, and increases in natural resource wealth are strongly correlated with greater corruption, authoritarianism, political and economic instability, and civil war. The root cause of the curse is the divergent effect that resource wealth has on the incentives of citizens and public officials. When unearned income — or “rents,” as economists say — replaces taxes as the main source of government funding, the social contract between a population and its government is severed. In well-functioning states (especially democracies), citizens consent to be taxed in exchange for public services and protection. Since the government relies on tax revenues for its very existence, taxation becomes the binding force of accountability between public officials and their constituents: public servants are incentivized to meet the public’s expectations because the population at large is the most direct and important stakeholder in the government’s functions. As direct investors, citizens also have a powerful interest in seeing that their taxes are used properly and efficiently. It follows that the introduction of nontax revenue — from foreign aid or the sale of valuable natural resources, for example — reduces a government’s reliance on revenue from its people and thus weakens the incentive to serve them. In the absence of the bonds of scrutiny and accountability that taxation forges, the external rents that fall into state coffers are seen not as belonging to the people but as up for grabs by the luckiest, the best connected, or the most brazen. Corruption, patronage, and rent seeking flourish. Elites grow rich; everyone else grows dependent, cynical, or detached. The result is that oil states generate not public goods for development but private and political goods instead. When state revenue seems to gush up from the ground as free money, and when resource rents displace taxation as the main source of government revenue, political elites have incentives to focus on the private accumulation of wealth and limit distribution of it to their political support networks. They have little reason to use this public treasure to deliver roads, schools, fertilizers, clinics, medicine, and so on. Meanwhile, the people have incentives to plead and compete for whatever crumbs may fall from the political table. These political dynamics already tend to impede progress in all low-income countries. They become insurmountable traps in ones where the state’s revenue is largely derived from external rents, especially a massive flow of oil revenues. Yet that is exactly what many African countries will likely soon experience. In the next decade, thanks to innovations in exploration and extraction technologies, oil producers will be able to profitably tap areas in Africa where reserves have long been suspected to lie. Twelve African nations are likely to become new high-level oil exporters. 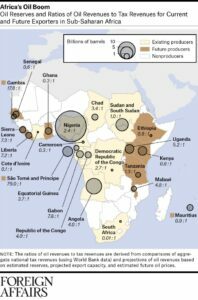 Although estimates of oil reserves and exporting capacity are notoriously volatile, it is possible that more than 25 billion barrels of oil will become available for export in Africa over the next decade — enough to increase export earnings many times over in some countries and revolutionize the social well-being of over one billion Africans. These new sources of oil are highly concentrated in two geographic areas: in West Africa, offshore in the Atlantic Ocean and the Gulf of Guinea, and in East Africa, in the Rift Valley, which runs through much of the region. Oil is not new to the Gulf of Guinea. With major long-term exporters, such as Equatorial Guinea and Nigeria, the area has been exporting as much as three million barrels of oil a day for over four decades. A period of unprecedented regional stability, however, has allowed for a new wave of investment in the exploration and production of previously untapped deep-water oil sources. 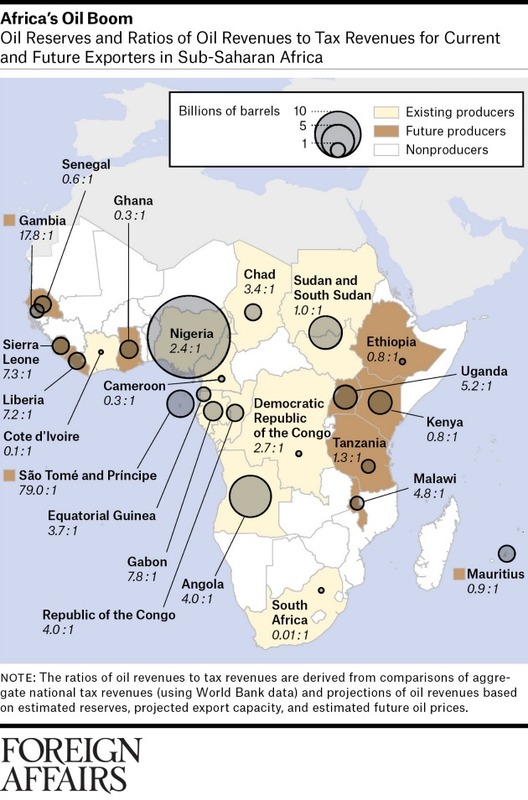 In the past five years, commercial-quality oil sources have been found in or off the coasts of Senegal, Gambia, Sierra Leone, Liberia, Ghana, and São Tomé and Príncipe. Although the estimates of recoverable oil reserves vary greatly by country (four billion barrels in São Tomé and Príncipe, two billion in Ghana, 1.5 billion each in Senegal and Liberia, and one billion in Gambia), and although these estimates vary in their certainty, what is clear is that each country has enough exportable oil to transform its politics and economy. In East Africa, tectonic plates have been splitting apart for millenia, creating a massive rift that runs for roughly 2,200 miles. As the plates have diverged, deep-seated plumes of magma have expelled oil into reservoir sands. Recent technological advances, including extended-reach drilling and long-distance imaging technology, have made the extraction of oil from these sands more economically efficient. Meanwhile, relative regional stability over the past decade has taken much of the financial risk out of long-term investment. As in West Africa, the estimates of reserves here vary. But the best ones available suggest that roughly nine billion new barrels of recoverable oil and gas could be found in the Rift Valley within the next decade: 3.5 billion barrels in Uganda, up to three billion each in Kenya and Tanzania, and at least half a billion in Ethiopia. At current prices, the new sources of oil and gas could inject close to $3 trillion into the economies of some of Africa’s poorest and least developed nations. Consider this: the total annual GDP of the 12 future exporters in 2011 was $181 billion. If $3 trillion flows to these countries from oil over a period of 30 to 50 years, then the total annual increase in economic output would amount to $60 billion to $100 billion — an increase of over one-third (and much more if oil prices rise). These future African oil exporters already rely heavily on another rent in the developing world: international assistance. Each of these governments already derives at least a quarter of its operating revenues from foreign aid; several of them, including Ethiopia, Liberia, Malawi, Sierra Leone, and Uganda, derive over half their income from it. Given current rates of economic growth, it is possible that every future African oil state (with the possible exception of Ghana) will derive more than half of its total revenue from some form of nontax income, whether it be oil or foreign aid. Historically, aid has generally come without conditions, although that has changed somewhat in the last decade or two, as donors have begun demanding political and economic reforms. For African elites who want to use state revenue as they wish, the beauty of new oil revenues is that they come with no conditions at all. For every $1 that the 12 future exporters currently receive from taxation, an additional $1.50 is received from foreign aid. With the infusion of oil and gas into their economies, these countries will become much more dependent on external rents. The median ratio of external rents to domestic taxation is expected to increase by a multiple of nearly five, from just over one to one to nearly five to one. Put differently, this will mean that the median new oil producer will be almost as dependent on oil and aid as the continent’s most famous victims of the resource curse: Angola, Chad, and Nigeria. External rents often ravage a state’s incentive structure when they significantly outstrip taxation — say, by a factor of two or more. That is already the case in some heavily aid-dependent countries, such as Liberia, Malawi, Sierra Leone, and Uganda. With the expected surge in oil income, these countries will see their revenue structures distorted to degrees even beyond those of Angola, Chad, and Nigeria. Even countries with more balanced revenue structures, such as Ethiopia and Tanzania, will experience major swings, with their ratios of rents to taxes likely soaring to above two to one. Although several countries in Africa have made great strides in improving governance over the past decade, no continent has more obviously displayed the sad drama of the resource curse: Africa’s oil-rich states have become strikingly more corrupt than their resource-poor neighbors. According to the Worldwide Governance Indicators, compiled annually by the World Bank, Africa’s current oil exporters rank in the bottom quintile globally in their relative ability to control corruption, formulate and implement effective policies, regulate private-sector development, and enforce the rule of law. Conversely, Africa’s future exporters currently well outpace the regional average in these percentile rankings. Unless a new approach is tried, oil will drag the future exporters down to the miserable governance levels of the current exporters. To date, no African country has been able to keep oil money from being largely usurped and misused by the powerful. Every one of the 12 current oil exporters currently falls into the bottom half of the UN’s Human Development Index. According to the World Bank, more than a tenth of all children born in oil-rich African countries die before the age of five, double the global average. If Africa is the worst-governed continent in the world, its oil states are the worst of the worst. At the heart of the resource curse lie weak institutions that fail to prevent public officials from exercising discretion over the revenue from oil and other external rents. Experts have traditionally recommended solving that problem by focusing on instilling transparency and accountability. If only the people knew how much oil revenue their government was receiving and how the money was being spent, the thinking went, they could hold their leaders accountable at the ballot box. And so the International Monetary Fund and the World Bank made increasing the transparency of resource revenue a condition for multilateral aid. Global efforts such as Publish What You Pay, a movement aimed at getting extractive industries to declare all the money they pay to governments for the rights to natural resources, and the Extractive Industries Transparency Initiative, a public-private partnership that sets global standards for transparency and accountability in resource-rich nations, have brought external pressure to bear on governments receiving income from natural resources. These initiatives are vital to promoting good governance in resource-rich developing countries, and they should be extended to the new oil producers. But transparency initiatives alone are not nearly adequate to the task. Resource flows are complex, with countless steps in the process from the time oil is discovered, extracted from the ground, and sold on the international market to when it is transferred as revenue to government accounts and spent by officials. Efforts to expose how revenues are accrued and dispersed have not worked as well as expected because, as the scholar Todd Moss has written, they “only shed light on one link in the long chain from oil in the ground to development outcomes.” Although transparency is an integral piece of any country’s pursuit of effective and honest governance, transparency alone fails to reverse the underlying incentives afflicting oil-rich countries. Given that reality, it is time to try a new policy approach, one that could drastically alter these incentives: the direct distribution of a portion of oil revenues to citizens as taxable income. In practical terms, this scheme would work as follows: When a government received revenue from oil and gas exports, a certain predetermined proportion of it (ideally, at least 50 percent) would immediately be distributed directly to the bank accounts of the country’s citizens. Then, the government would treat those distributed revenues as income and tax some of it back. Each country could adjust the rate of taxation to transfer only that amount of cash that economists determined could be absorbed by the average poor family without fueling inflation or distorting incentives. This oil-to-cash system should not be confused with those of oil-rich Arab states, such as Kuwait, Qatar, and Saudi Arabia, that lavish on their citizens payments and cradle-to-grave services. These programs lack two key features. First, the money goes to the state and only then is distributed (often at its discretion), as financial payments, social services, increases in public salaries, and so on. Second, citizens in these countries do not pay any income tax, so the crucial bond of accountability never materializes. Instead of increasing citizen participation and strengthening accountability, state-to-citizen distributions in these countries simply use oil revenues to keep the people satiated while further entrenching the power of elites. In doing so, these payments serve to increase citizens’ dependence on the state, rather than increasing their ownership of it. The oil-to-cash approach has been engineered by a team of scholars at the Center for Global Development (including Nancy Birdsall, Alan Gelb, Alexandra Gillies, Moss, and Arvind Subramanian) who contend that it would attack the fundamental causes of the resource curse. Directly distributing oil revenues as taxable income would create a broad and active constituency of citizens who were directly affected by the government’s management of their resources, in place of the often passive populations of corrupt, resource-cursed states. In a single step, it would build a broad domestic tax base — a fundamental piece of any modern, well-governed state. Moreover, immediately taxing the income through explicit deductions from the transfers would make citizens aware of the fiscal relationship, strengthening the ties of accountability between the officials who control the state and the people whose money they are spending. Citizens would come to realize that it is indeed their money that the state is spending. To many, the concept of direct cash transfers of oil dollars seems like a well-intentioned but utterly infeasible option. For starters, one might ask, how can countries that lack modern banking sectors or even national identification systems be expected to implement cash-transfer programs? The answer is that many already have. As Moss has written, as of 2009, some 60 developing countries, including Botswana, Brazil, India, Mexico, and Panama, have made regular direct transfer payments to approximately 170 million people. That success owes to recent advancements in affordable and reliable personal-identification technologies that use biometric identifiers such as fingerprints and facial and retinal recognition. Gelb estimates that as many as 450 million people in developing countries have had their biometric data cataloged. Although governments will need to invest in systems that allow them to properly and transparently transfer money into citizens’ accounts, new technology in the area of electronic banking is making this process continuously cheaper and more logistically feasible. Africa has experienced explosive growth in cell-phone subscriptions, now estimated at over 800 million, which, even allowing for users with multiple devices, means that the majority of Africans now have access to cell phones. Moreover, mobile-banking platforms, such as Kenya’s M-Pesa, are proliferating. Other skeptics might argue that it would be more efficient for states to spend their oil wealth on development projects than to put it into the hands of the poor and uneducated. But the argument that poor people don’t understand their best interests as well as bureaucrats and public servants do is a paternalist myth. Indeed, evidence from existing cash-transfer programs reveals that the transfers are most often spent on food, education, health care, and business investments. Moreover, most of the money is spent on local goods, stimulating community-level development. The greatest obstacle to oil-to-cash programs is, of course, political. Why, many wonder, would any politician ever willingly give up control of oil money? Indeed, in developing countries, control over natural resource revenues fuels the patrimonial ties and patronage networks that keep leaders in power. And it is true that an autocrat is very unlikely to give up this vast opportunity to accumulate wealth and perpetuate his rule. But nine of the 12 future oil exporters are democracies, and therein lies the hope for these revenue-distribution systems. In these countries, competitive elections with uncertain outcomes determine who rules. In some of them, democracy may well expire in the fever of sudden riches. But in others, a broad coalition of forces in civil society and politics could compel rulers to implement some kind of oil-to-cash model, or else vote into office an opposition party that has pledged to do so. It is hard to imagine a more compelling opposition platform than the distribution of at least some share of natural resource revenues directly to the long-impoverished people who are the real legitimate owners of the country and its resources. Public opinion survey data from the research project Afrobarometer show that Africans are more aware of their rights and more demanding of democracy than social science theories have traditionally assumed about the poor in developing countries. Moreover, African civil societies are becoming better organized and more assertive, and with the growth of new communications technologies (including community FM radio stations), a more vigorous public sphere is emerging. Once African publics understand the possibilities of oil-to-cash programs, they may seize on the idea. At that point, it will not be easy for elected leaders to insist that the state monopolize these revenues, unless they rig elections and repress protests. Desecrating democracy to corner this wealth may be a tempting strategy, but it is one with huge risks, including being toppled from power and punished. Some democratically elected leaders could opt instead to become public (and international) heroes by embracing reform. Unfortunately, the prospects for preempting the oil curse are much worse in Africa’s authoritarian states, for they lack the political competition and civic pressure that could induce reform. But despite the dangers that go along with challenging autocrats, public demands for reform may rise as corruption and misrule deepen, ultimately leading the regime to make meaningful concessions. Such a scenario is not unthinkable, for example, in Uganda, where, after nearly three decades of Yoweri Museveni’s presidency, the signs of governance rot are spreading, and the public is noticing. Embracing at least a limited oil-to-cash reform would burnish any autocrat’s tarnished legitimacy. After all, if presidents and ruling parties gave some of the new wealth to the people, that would still leave quite a lot of state revenue for them to manage. Even partial reform would begin to change the relationship between citizens and the state and create a new incentive for the public to monitor its rulers’ handling of oil wealth. Nobody knows exactly how much oil will be pulled from the ground of Africa’s new oil exporters over the next decade. Current projections made by governments and oil exploration companies might be overly optimistic, or perhaps the current period of relative political stability in Africa will end, scaring off investment in oil infrastructure. Regardless, oil will shape Africa’s future more than ever, and some groups and individuals will find themselves much wealthier in the next decade. The choice that Africa’s governments and people have to make is whether the winners will be, as before, well-connected elites or whether the pattern can be broken and a new premise can be embraced: that a country’s natural resources belong not to the state but to its people. Admittedly, the oil-to-cash plan is an unwieldy and largely untested initiative. But in an area where every conventional approach has failed, only a radical departure is likely to succeed. The biggest mistake Africa’s new oil producers can make, one that several are already making, is to assume that their countries are different: that through good leadership, better statecraft, or incremental improvements in their legal systems, they can avoid the resource curse. The stakes are simply too high for anything but a radical new approach.